Mike asks a lot of questions about “What happened?” to our hometown. I am sure we all constantly scratch our heads wondering the same thing! I graduated from Holy Trinity in 1963. We lived on Chestnut Street, a dead end off Center St, above Oak. There were a lot of kids in just one block: Bobby & Donna Namejo, Richard & Kathy Erikson, Lori Carcho, Terry & Jill (Butcher? ), Andy “Duke” Dyakan, 5 Cimbala’s–Charlotte, Eddie, Carl, Marlene & Johnnie, Valerie (Lagan? ), Jim & Steve “Sandy” Skalican, whose dad Steve had a body shop in the alley. There was a vacant church at the top of the hill and I can recall the steeple being removed. There was a mom and pop store on every corner, Ivan’s Market at the top of High Street, near the Valiknac’s (Vilma went to HT and her older brother Tommy, a really nice kid). We moved to West Mifflin in 1957, Mellon St in Duquesne Annex, a block from the fire hall & the Village Tavern, where you could get a fish sandwich for 35 cents, which was so big it would feed 4 of us for Friday dinner. My brother, Damian and I had a paper route on Crawford, Maryland, Burns & Wools streets in Duquesne, where we delivered the McKeesport Daily News. The paper cost 6 cents. We had about a hundred customers and most of the tipped at Christmas. Nice Mrs. Bedont (who also owned the market on Crawford across from the Union Grill, I think) tipped us every week. We earned a penny on every paper we delivered. Most of our customers were nice, some crabby and a couple were disagreeable, demanding or just deadbeats. One guy insisted that we deliver the paper around back up the back porch steps, when his front door was two steps off the front walk. I was chased by dogs a few times, and I still don’t like them. Damian and I also worked at the Duquesne Isaly’s in the late 60’s but that’s a story for another time. But why was the thriving business district demolished and replaced with a cheesy strip mall? Alexander’s market, Woody’s drugs, 5 & 10, Feig’s Bakery, Plaza Theater where admission was 25 cents, Stone’s and Levine’s–2 hardware stores, Jerry & Bud’s donut shop and the shoe store (Karen’s) where you could see your toes though a real X-ray machine!!! All gone. I posted the following article from The Duquesne Times that was published on 5/26/1960. I remember how the redevelopment seriously impacted my father’s service station on North 2nd Street. To his dying day, he never got past the fact that his livelihood was taken away from him as a result of “eminent domain” and the Redevelopment, and it yielded a parking lot as a result. I understand that the current strip center located on what was South 2nd Street is destined for a renovation of sorts. If anyone has information that they would like to share about the chamges that are supposed to occur, please share them with us. This entry was posted in Church and School - Holy Trinity, Duquesne Buildings, Feedback From Our Friends, Stores and Businesses. Bookmark the permalink. 7 Responses to All In The Name Of Progress??? Let’s not forget Finkelstein’s. You could buy anything there from work clothes for the mill to gym shorts for Duquesne High School, to tablecloths and linens. I remember Mr. Finkelstein wrapping things in brown paper. I guess you could call it a dry- goods store. Every other Tuesday was “payday”. Mothers waited for us outside of HN and down to the bank to pay utilities and shop “downstreet”. Those were the days. Those GIANT fish sandwiches at The Village Tavern were the BEST. Also the ones at the Croation club, thirty cents a piece! The Plaza Theater, Woody’s,What happened? It’s so much fun remembering, but it also makes me sad. What happened to Duquesne? That’s easy. Congress, which controls our borders, also controls the illicit drug trade. The Mon Valley was simply targeted as a good place to conduct this business. As drugs became pervasive, standards were lowered. And a brain drain took place, where mobile families moved their children to areas less likely to be harmed by this scourge. In the mean time, socialists who were more interested in controlling peoples lives rather than helping them succeed, ensured that section-8 housing would prevail in Duquesne. No home ownership often meant that families did not take care of their dwellings. Duquesne and the rest of the valley now suffers, while the recent natural gas boom, that could provide relief to so many with good jobs, struggles to meet local employment levels as many would-workers fail to pass drug tests. Fortunately, there are pockets of success with Durabond and U.S. Steel making drill pipe and natural gas pipeline. This industry is employing hundreds now. I remember Mike Ferchak from my days at Holy Trinity School. I was a year behind him and left in 1964. My grandfather was “Big Bill” Soltis who served as a Duquesne policeman into the 1950s. He lived on Third Street—a stone’s through from Holy Trinity School. Mike might also remember my brother Allen, who graduated from Holy Trinity in 1962 and my late cousin, Ray Soltis, who graduated from there in 1961. Ray likely lived right down the street from Mike on Mellon. Ray’s Dad and Mom still live there. I think that the destruction of all the buildings to put in the strip mall was dumb. I still remember the Duquesne City Bank, Woody’s Drug Store, the Plaza and all of the other great businesses along that street. I still remember waiting in front of Woody’s for the Duquesne Motor Coach buses to take me to my parent’s old home on Pennsylvania Avenue near Duquesne Annex Fire Hall in West Mifflin. I live in Shaler Twp now but still enjoy jumping on my Yamaha and buzzing through Duquesne. Anyone who’s ever drive a motorcycle up Center Street knows what a thrill that is. Mike: Hope that you make some connections through the Duquesne Hunky’s posts. I love Jim’s blog—brings back a lot of great memories of the town where I grew up. Jim/Mike, all you have to do is follow the money to find the answer to Mike’s question. Clearly someone profited by it. And, it surely wasn’t the residents (tax payers) of the town of Duquesne. Missed you at the reunion this year. You are right on the money when you say follow the money. 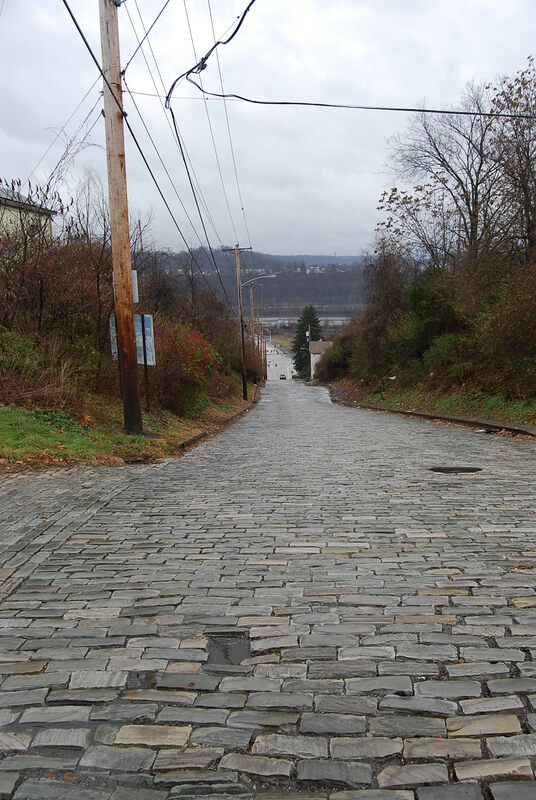 As kids growing up in Duquesne we didn’t understand or pay attention to that sort of thing. We had enough of our own things (school, sports, girls/boys etc.) to deal with. The “movers and shakers, powers that be, those with the inside track” made sure things went their way. I’ve been enlightened by some of Jim’s posts.